Double Down – Run For Your Life! Every book has a back story. 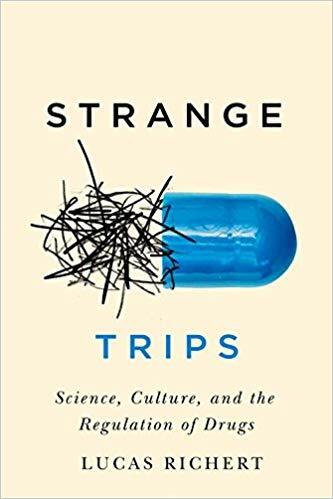 In the following series of posts, I share some thoughts about the inception, development, and completion of my new book, Strange Trips: Science, Culture, and the Regulation of Drugs. The second phase of writing my second book, Strange Trips, began in September of 2015. I signed a contract with McGill-Queen’s University Press and set to work. But it was far from straightforward. I was a full-on member of the academic precariat at the time. And it was a difficult period – at least in a professional sense. I was juggling a lot of lectures at the University of Saskatchewan, looking after my kids part-time, and trying to stay engaged in my chosen field. After my PhD viva in London (see my last post), I returned to Saskatchewan to work at the Health Quality Council. (It was a tremendous experience.) Then I began a SSHRC post-doctoral fellowship in 2011 and the time just flew right by. Seriously. It zipped by faster than I could have imagined and I wasn’t at all ready for the end of the way-station that was my postdoc. From 2011-2013, I worked on my first book, A Prescription for Scandal: Conservatism, Consumer Choice and the FDA during the Reagan Era. I also stayed super busy with applying for countless academic jobs. (Really, it was a lot.) I certainly meant to focus on Strange Trips after I came up with the idea in 2010 (however ill-formed), but I ultimately focused on publishing my PhD dissertation. In 2014, I published A Prescription for Scandal. I was extremely proud of it and it won a book prize. However, it didn’t lead to a tenure-track job. It was a really difficult moment and by 2015 I was questioning academia. There was a real high and low associated with that book. It wasn’t easy. That’s for sure. I was such a wet-behind-the-ears neophyte…and I struggled to “sell” myself or engage with my colleagues via social media. I wasn’t a blogger back then. And I wasn’t on Twitter. Worse still, I didn’t have a good sense about packaging my work – how to write a book proposal or talk to acquisition editors with even a modicum of confidence. But I had confidence in myself. I was also surrounded by a strong network of family and friends. To put it another way, I wasn’t alone. I had help. I was in a stable relationship. I had been (relatively) careful with money. A large family could babysit. I was lucky. So I decided to double-down. In early 2015, I kept teaching at the University of Saskatchewan. I developed new classes. I stayed engaged. More than that, I didn’t stop writing. I wrote and wrote. I decided that I was not going to let the system “get me down.” At least for a little while longer. …but I honed my proposal and submitted it to MQUP. It was received positively! After some back and forth, a revised proposal, and a series of productive conversations, we agreed to work together. That was September. Little did I know that I’d be moving to Scotland within the year.